(Rick Egan | The Salt Lake Tribune) Utah County Sheriff, James Tracy,=talks about how the body of Elizabeth Elena Laguna-Salgado was found in Hobble Creek Canyon, at the Sheriff's Office in Spanish Fork, Thursday, May 24, 2018. (Rick Egan | The Salt Lake Tribune) Provo Polive Chief Richard Ferguson Provo Police talks about the case of Elizabeth Elena Laguna-Salgado, whose body was found in Hobble Creek Canyon, at the Sheriff's Office in Spanish Fork, Thursday, May 24, 2018. (Rick Egan | The Salt Lake Tribune) The remains of Elizabeth Elena Laguna-Salgado, were was found somewhere in Hobble Creek Canyon. Thursday, May 24, 2018. (Rick Egan | The Salt Lake Tribune) Utah County Sheriff Sergeant Spencer Cannon talks about how the the body of Elizabeth Elena Laguna-Salgado was found in Hobble Creek Canyon, at the Sheriff's Office in Spanish Fork, Thursday, May 24, 2018. (Rick Egan | The Salt Lake Tribune) FBI special agent Eric Lerohl talks about how the the body of Elizabeth Elena Laguna-Salgado was found in Hobble Creek Canyon, at the Sheriff's Office in Spanish Fork, Thursday, May 24, 2018. (Rick Egan | The Salt Lake Tribune) Provo Polive Chief Richard Ferguson Provo Police talks about the case of Elizabeth Elena Laguna-Salgado, whose body was found in Hobble Creek Canyon, at the Sheriff's Office in Spanish Fork, Thursday, May 24, 2018. (Rick Egan | The Salt Lake Tribune) FBI special agent Eric Lerohl talks about how the the body of Elizabeth Elena Laguna-Salgado was found in Hobble Creek Canyon, at the Sheriff's Office in Spanish Fork, Thursday, May 24, 2018. (Rick Egan | The Salt Lake Tribune) Chief Ferguson, Provo Police (center) and FBI special agent Eric Lerohl (right) listen as Utah County Sheriff, James Tracy, (left) talks about how the the body of Elizabeth Elena Laguna-Salgado was found in Hobble Creek Canyon, at the Sheriff's Office in Spanish Fork, Thursday, May 24, 2018. (Rick Egan | The Salt Lake Tribune) James Tracy, Utah County Sheriff's office, talks about how the the body of Elizabeth Elena Laguna-Salgado was found in Hobble Creek Canyon, at the Sheriff's Office in Spanish Fork, Thursday, May 24, 2018. (Rick Egan | The Salt Lake Tribune) Chief Ferguson, Provo Police (left) and FBI special agent Eric Lerohl (right) listen as Utah County Sheriff, James Tracy, talks about how the the body of Elizabeth Elena Laguna-Salgado was found in Hobble Creek Canyon, at the Sheriff's Office in Spanish Fork, Thursday, May 24, 2018. Spanish Fork • For three years, police, volunteers and family of Elizabeth Elena Laguna-Salgado searched Provo trying to find her. In the early days, they hoped to find her alive. Later, they began looking in Provo’s canals, drain pipes, vacant lots and other locations her body could be concealed. It turns out, everyone was looking in the wrong place. Her body was located Friday in Hobble Creek Canyon, whose mouth is about 13 miles from where she was last seen, the Utah County sheriff and Provo police chief said this week. Police suspect she was killed. “This is an active homicide investigation,” Utah County Sheriff Jim Tracy said at a news conference here Thursday. “We don’t know exactly how or why she ended up in Hobble Creek Canyon,” he added. Later Thursday, Laguna-Salgado’s uncle, Rosemberg Salgado, asked for the public’s help in finding the person or people responsible for his niece’s death. Tracy said his office only became a participant in the case Friday, when a man who pulled off the canyon road to urinate walked into the woods or brush and found a skull and clothing. He reported the find to the sheriff’s office. Tracy said a medical examiner and anthropologist used dental and bone records to confirm the remains were Laguna-Salgado’s. But Tracy said the medical examiner has not determined how she died or whether it was a homicide. (Rick Egan | The Salt Lake Tribune) The remains of Elizabeth Elena Laguna-Salgado, were was found somewhere in Hobble Creek Canyon. Thursday, May 24, 2018. 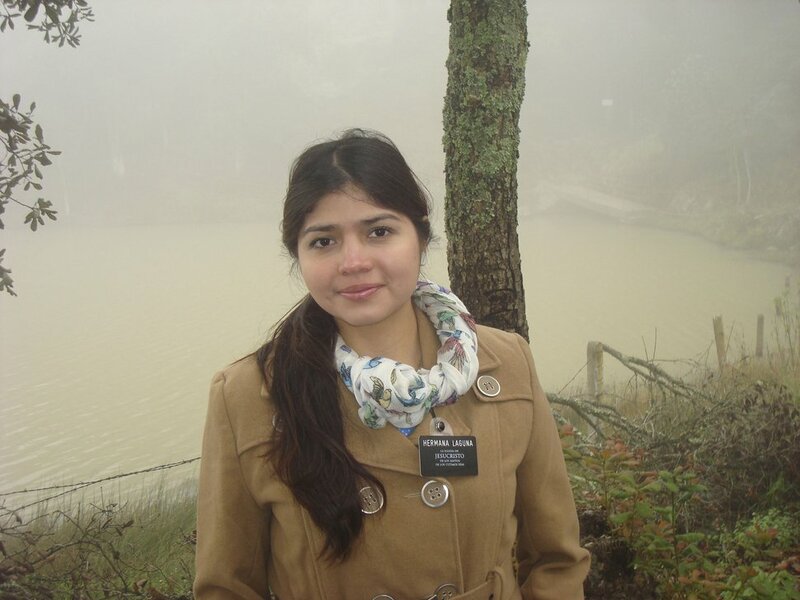 The mystery began April 16, 2015, when Laguna-Salgado, then 26, disappeared while walking home from classes at the Nomen Global Language Center in Provo. She sent a text to her sister in Mexico at 1:30 p.m., and her cellphone pinged for the last time from a tower near the school and her home not long after that. Provo police investigated her disappearance, aided by the FBI, Department of Homeland Security, Interpol and other agencies. Hundreds of tips came in from across the country, but none turned up any clues to Laguna-Salgado’s whereabouts. Ferguson on Thursday said Provo detectives traveled to Mexico with the FBI to investigate the case from there. Ferguson said Laguna-Salgado had been in the United States for three weeks before she disappeared. She had earned a college degree in her native Mexico. She followed that by going on a mission for The Church of Jesus Christ of Latter-day Saints and coming to Utah to study English — which she still had not learned when she disappeared. 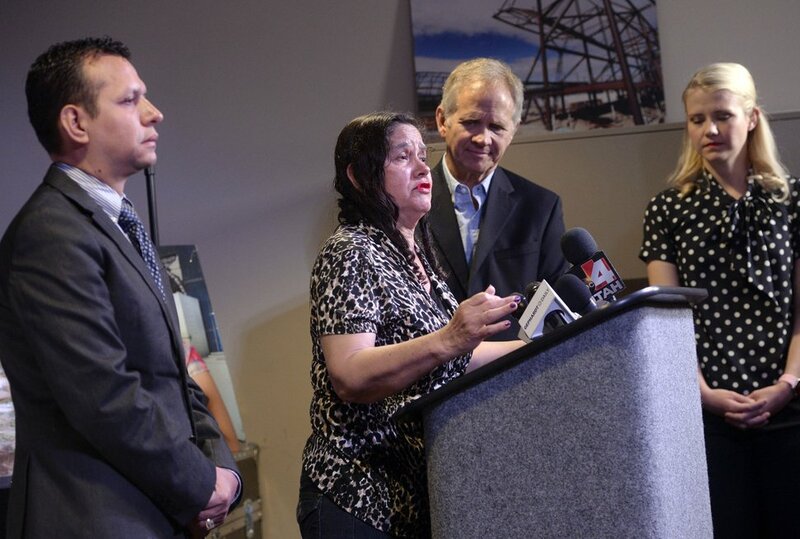 Al Hartmann | The Salt Lake Tribune Libertad Salgado, mother of Elizabeth Laguna-Salgado gives an impassioned plea for any information on her daughter's disappearance one year ago at a press conference at Rio Tinto Stadium in Sandy on April 18, 2016. Rosemberg Salgado, (her Uncle), left, and Ed and Elizabeth Smart pleaded to keep the case in the news and for anyone with information to contact the family or Provo Police. The family had maintained hope she would be found safe, Salgado said, but this is the result they were expecting. Salgado and Rudemberth Salgado, who live in California, said in July 2015 that Provo police had been excluding them from updates in the case over supposed inconsistencies in their stories. But Rosemberg Salgado on Thursday rebutted the idea that detectives suspect family members in the disappearance and death. “As part of the investigation, they always have to investigate everyone,” he said. Ferguson on Thursday said detectives have persons of interest but no suspects. “Our eyes are wide open,” Ferguson said. Tracy declined to give certain details of the remains, including precisely where they were in Hobble Creek Canyon. He did say they were off the road and not on any hiking trail, nor was there any evidence Laguna-Salgado could have arrived at that location on her own. The remains were not in a grave, the sheriff said. The man who found them has been cooperative, has no connection to Laguna-Salgado and is not considered a suspect, Tracy said. Eloy Monge, the consul for legal protection with the Mexican Consulate in Salt Lake City, attended Thursday’s news conference, too. He said his role was to help the Laguna-Salgado family members. That will include helping them return her remains to Chiapas, should they want that, Monge said. Anyone with information in the case can call Provo police at 801-852-6210. Reporter Sean P. Means contributed to this story. Correction: 7:23 p.m., May 24 • An earlier version of this story misspelled Rosemberg Salgado's name.